Purple is my November color, symbol of creativity and higher wisdom. Those who respond to purple may have an artistic or dramatic flair. Some wear it, because they intuitively know it balances thinking and calms hyperactivity. Purple can help you too. Use it to give you a sense of connection and to soothe your spirit. Gaze at the mandala below. It suggests the continuous circle of life. 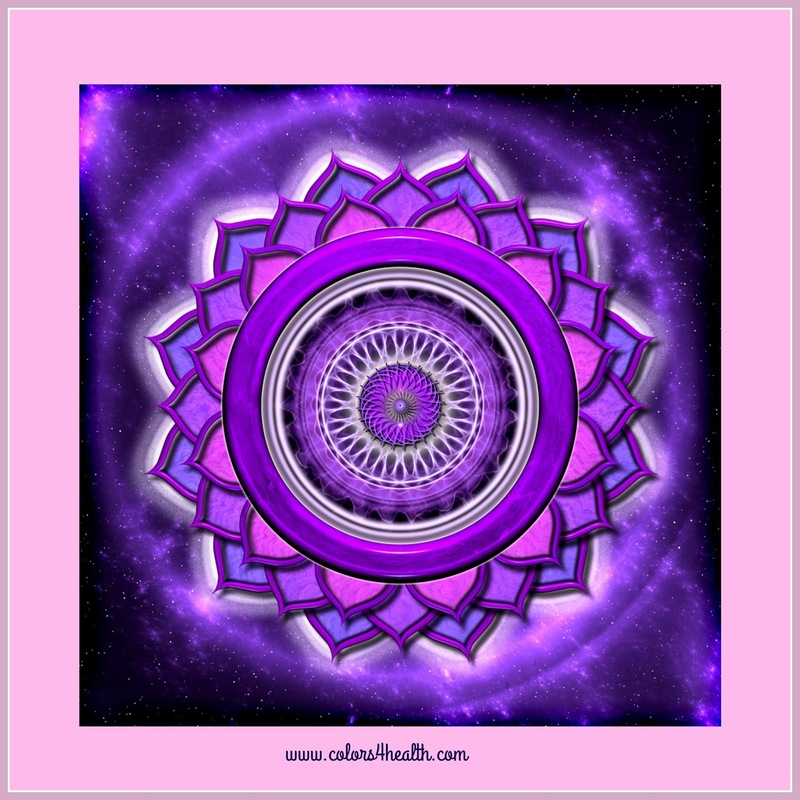 If you desire completion, continuity, or a new beginning, envision a purple mandala. Place a purple drawing or representation of a mandala in your home meditation area. Then, while you mediate, know that purple energy supports you in each moment as thoughts and feelings freely flow through you. Lavender is a calming essential oil made from flowers that are purple. It's a traditional remedy for insomnia or restlessness at night. It also works to heal scratches, burns, headaches, and worry. When you have trouble falling asleep, imagine a field of Lavender flowers. Sprinkle a few drops of Lavender essential oil on your pillow or tip of your nose. It helps you drift softly off to dreamland. In the color spectrum, purple has the shortest wavelength and vibrates at the highest frequency. Purple paint is a blend of relaxed, cool blue with excitable, hot red. This hue is often associated with royalty, nobility, luxury, power, and ambition. Purple also signifies wealth, wisdom, dignity, grandeur, devotion, independence, and magic. In some cultures, purple symbolizes mourning, decadence, and the supernatural. 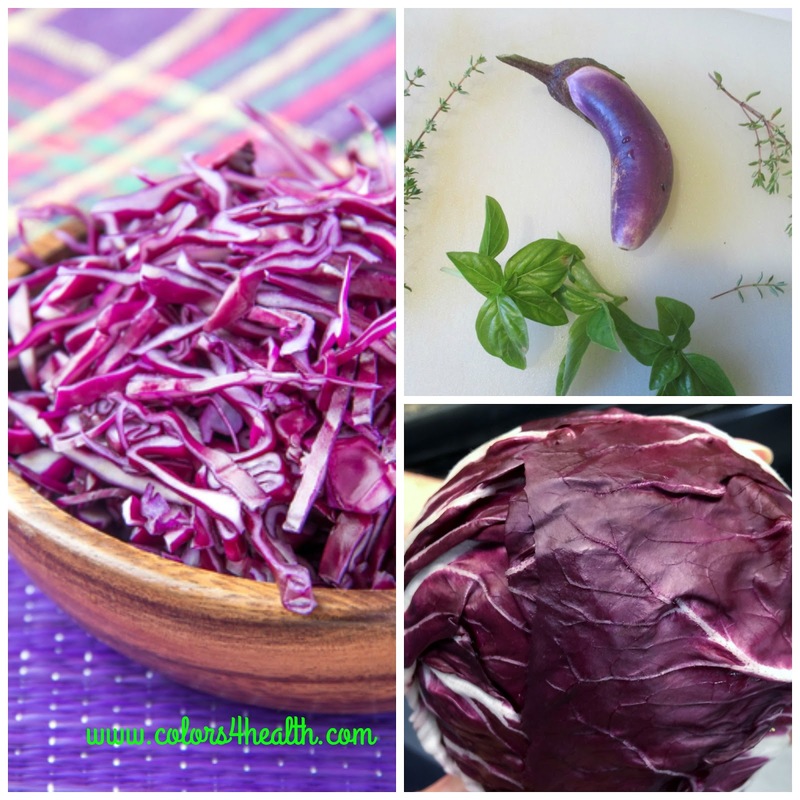 Want to put more purple into daily living? Wear an Amethyst ring or bracelet to feel protected and serene. Place purple crystals in your work or home environment to feel less pressure about deadlines and reduce stress. 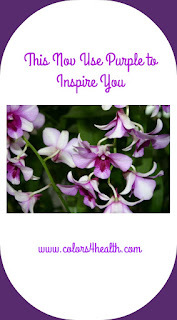 Place purple orchids or another purple flowering plant beside your computer, tablet, or reading area to take note of its beauty, relieve eye strain, and give you a fresh perspective. Put purple in your life when you are learning to integrate new skills. Use purple pencils, markers, or other drawing material to encourage your imagination to work in practical ways. 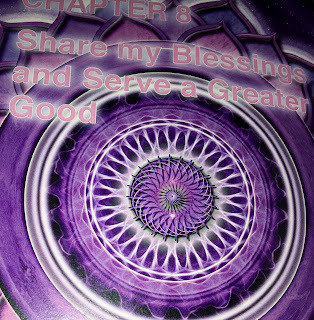 Purple is the color of the crown chakra, the energy center that supports trust, devotion, inspiration, and wisdom. Focus on the area at the top of the head and envision purple. It can help you to feel unity within yourself, with others, and with the Universe. November is a good time for purple. The color conveys grateful energy. Think of purple's rich color before you start a project or are at a gathering. It will help you view your experiences as building blocks to greater understanding and knowledge. Purple is a great Thanksgiving color, one that reminds you to count your blessings. 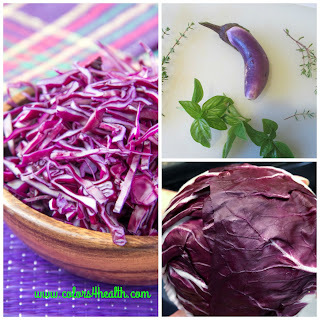 Perhaps its ability to inspire will motivate you to serve red cabbage, radicchio, eggplant, or purple grapes at a festive meal this season. The holidays are fast approaching, and I wish you'd consider purchasing the interactive self-care journal Colors of Joy. Its color themed activities include ones that feature purple. Colors of Joy is an eye-catching addition to any woman's self-care journal library. In fact, it makes an attractive gift for all the women you care about. See more and order Colors of Joy on my Website. If you prefer, order it through Amazon Books. Before you go, please comment by scrolling down below and posting your comment in the space provided. I'd love to know about your relationship to purple. For me, it's a unifying color that makes me feel happy, peaceful, and alive. How does purple make you feel? Do you wear it often and for what reasons? 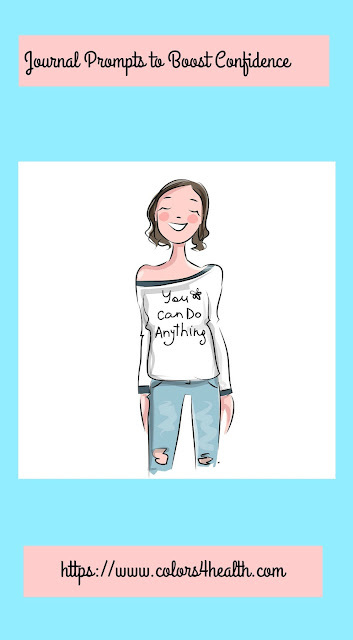 Did my blog post and illustrations help you in some way? Please comment below. This post is FEATURED at Thursday Favorite Things. Yahoo! I love purple, it is one of my favorite colors. Lavender is very calming, and since it has been kind of rough these past few months, I will grab some lavender candles, and make this my color theme going into Christmas! Thanks so much for sharing! Love it that you love purple and find lavender very calming. Me too. Thanks +Bleu Baileye for sharing my post. Have a great weekend. 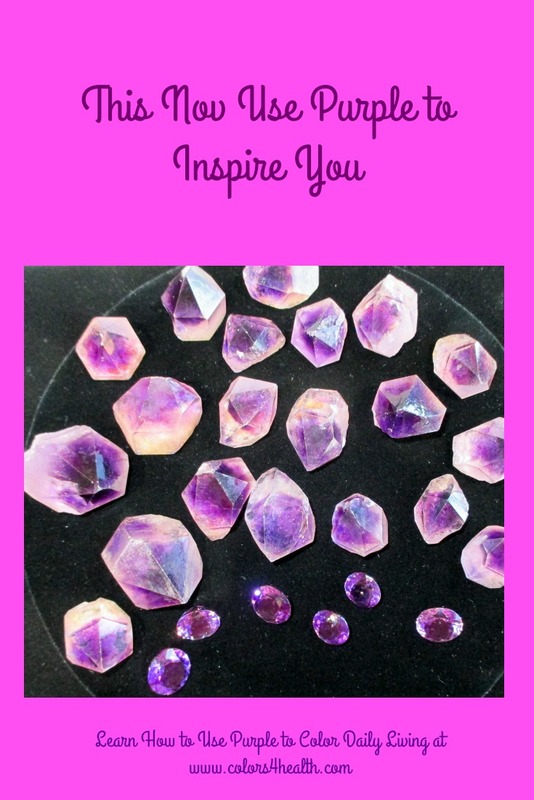 I love all shades of purple and found your post very interesting so I've chosen it as my feature for the OvertheMoon link party. Congratulations and look for your feature next week. Thanks so much Sue both for hosting and selecting my post. I am thrilled about being featured next week at Over the Moon, where so many fun ideas and helpful info can be found. Have a "Sizzling Over 60" Thanksgiving and be well. Thanks Angie. I agree that purple looks and feels good. Be well and have a great day.